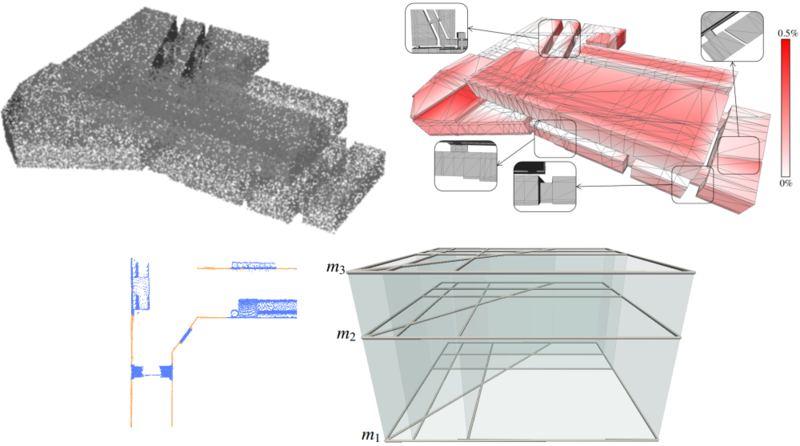 Abstract : We present a method for automatic reconstruction of permanent structures of indoor scenes, such as walls, floors and ceilings, from raw point clouds acquired by laser scanners. Our approach employs graph-cut to solve an inside/outside labeling of a space decomposition. To allow for an accurate reconstruction the space decomposition is aligned with permanent structures. A Hough Transform is applied for extracting the wall directions while allowing a flexible reconstruction of scenes. The graph-cut formulation takes into account data consistency through an inside/outside prediction for the cells of the space decomposition by stochastic ray casting, while favoring low geometric complexity of the model. Our experiments produces watertight reconstructed models of multi-level buildings and complex scenes.